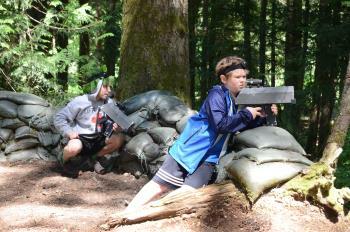 Join us for Battlefield Live Outdoor Laser Tag. Come out by yourself, with your family, or with your friends for a session of Battlefield Live. Players of all ages, from all over our area are invited to come together and play against one another in this walk-on style setting. Battlefield live is an exceptional laser tag experience. Played outdoors in our wooded fields, players use laser guns which can simulate a variety of weapon systems to tag members of the opposing team. Sensors on the gun as well as sensors worn on either a headband or fabric vest record the hits on the opposing player. Game types range from capture the flag to team death-match scenarios. Due to the size and weight of the guns, we recommend that players are 7 years of age or older. This game is great fun for kids and adults alike. If you've ever wanted to try our Battlefield Live Outdoor Laser tag, but have not had the opportunity, you are not going to want to miss this event. Players are allowed to walk-on without a reservation at the cost of $23 a player. Walk-on players must complete a waiver, or have their parent/guardian complete a waiver on their behalf if they are under 18. Waivers can be obtained when you arrive, or online at http://cedarsprings.camp/waivers. Pre-registered players will be prompted to complete the wavier as a part of the reservations process. Game play takes place at our Lake Stevens Campus at 4820 State Route 92. Please give us a call at 425-334-6215 if you have any questions.